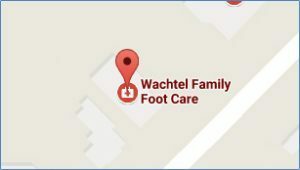 Wachtel Family Foot Care, located in Lansdale, PA is committed to providing quality and comprehensive foot, ankle, leg and lower extremity care. We also service patients from Hatfield, Harleysville, Spring House, Philadelphia, Quakertown, Jenkintown, King of Prussia, Norristown, and Gwynedd Valley. Jeffrey Wachtel, DPM is board certified in Podiatric Surgery and specializes in the treatment of fungal nails and plantar warts through the use of the carbon dioxide laser (CO2 laser) and therapeutic lasers, biomechanics, fall prevention, and the treatment of gait abnormalities, such as drop foot. He employs gate analysis to create custom foot orthotics; using the brand Footmaxx. Jeffrey Wachtel, DPM believes a more conservative approach makes for a better treatment. Below is a list of some of our services. This place hands down has been the best Dr's office I have been to yet. Very friendly, and very quick to get you in and the care you receive is unprecedented. They took great care of me! Dr. Wachtel solved my problem faster than I would have ever expected. They really take care of your feet and you. I always feel happy to visit my Podiatrist. Dr. Wachtel is an excellent doctor, very kind and caring. He explains what needs to be done so I can understand it. Any problem I have had, he has taken care of it. Thank you for taking such good care of my mother in law and father in law. Its always difficult to change doctors at there age, But all of you made it so easy for them. Very pleasant visit. Got a good explanation of my ankle problem. will await a future visit for more detailed diagnosis. Dr. Wachtel and his staff are excellent. I had a number of foot problems and they were all addressed during my first appointment. I have already recommended this practice to a friend. Excellent. The staff was so kind, friendly and eager to be of service. Seemed like the "good ole days" where people actually cared.Really, really liked Dr. Wachtel, very gentle and personable. Very pleased. Everyone was very friendly and professional' My feet feel great. I was so glad to finally find a doctor who checked out my feet with xrays. He helped me with my foot problems. Everyone there was very polite and glad to see me! Very caring. Dr. Wachtel takes time and answers all questions, also a very pleasant staff. My experience was very good, had no issues. Everyone on the staff was polite and helpful. Thank you. I visited Dr WACHTEL'S office few times in couple years. I noticed that waiting period at the actual appointment was minimum. I think Dr values everyone's time. Excellent service. Thank you everyone at Dr WACHTEL'S office. We had a great experience. Everyone is so nice! Always feel very welcome. Staff is friendly and take the time to know you. High quality care. The doctor and staff show concern and professionalism. The whole experience gave me a sense of comfort and I was able to relax. Always the best, most professional care. They are concerned about your health and take all the steps necessary to remedy the situation. Dr. Wacthel took and explained everything that I could clearly understand the problem and how to fix it. The staff was friendly, kind and happy to help. Great job treating my son's ingrown toe nail. Dr. Wachtel’s office is great wonderful and superb! Dr. Wachtel is full of knowledge and experience. The office including Carolyn and Kim is a pure joy where I receive excellent treatment and compassionate care, especially for those who are 50 years and older.